When there’s 3′ of snow in the front yard, you work on still life. Tansy from the lower garden, seckel pears from the tree in the dooryard and the Spanish china from Aunt Dorothy. 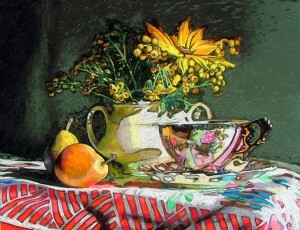 This entry was posted in art, still life and tagged pastel, still life on February 24, 2009 by APo. The still life is just beautiful! ps I remember the poverty cake.